Having three day weekends sound like a great trade-off for working 10-12 hour shifts for four days straight, but is it really? Ever since business magnate Henry Ford called for a reduction of the working hours from 48 to 40 back in the early 1900s, maybe it’s time to make another cut, and this time from 40 to 35. The shift to 40 hour work week was what the era called for at the time when it was imposed. Upon having it implemented, Ford proved that working fewer hours actually boosts productivity and promoted a better work-life balance. Nowadays, with the advances in our tech and our current lifestyle, it’s a good time to seriously consider (or go as far as full implementation of) 7-hour work days in the Philippines. Early this year, the House of Committee on Labor and Employment gave the thumbs up on House Bill 5068. It allows employers to increase the number of working hours in a day to 12. Consequently, by extending the work schedule, it reduces the number of working days into four per week. This is so because the current Philippine Labor Code still requires full-time employees to work 40-48 hours in a week. According to the author of the bill Baguio Representative Mark Go, the bill intends to give employers the option to go for 10-12 hour workdays, also referred as the compressed workweek. Go believes that the change will increase productivity and encourage a better work-life balance. Employers should know that they are not obliged or mandated to have the compressed workweek schedule in their company, it still remains optional. Go’s efforts are commendable for giving employers and employees such an option, though one couldn’t help wish that the 35-hour workweek was also put into consideration. If implemented, it would be interesting to see if the Philippines has what it takes to stand alongside Germany as one of the few countries in the world that shows that when it comes to working hours, less is more. Stamina and focus are two factors that contribute to the employees’ productivity, given that they are knowledgeable in what they do and that they are in a good mental state. As long as they have the endurance and mental focus, their productivity can reach optimal levels. In a 10-12 hour workday schedule, stamina and mental focus are clearly at risk, seeing that many employees already feeling drained in the current eight-hour work schedule. Even with the extra day of rest, there is a limit of how long an employee can work at their optimal levels in a day. In a 35 hour per week schedule, stamina and mental focus are not much of an issue. Compared to an eight-hour schedule, employees get an extra hour to rest up, spend time with their family/friends, or have more “me” time. They get more chance to recover and keep their minds fresh. The 10-12 hour-shifts tips the balance heavily to one side during the work days. Imagine what adding two to four more hours to the current 8AM-5PM schedule can do in one’s lifestyle. An employee working in a 12-hour schedule is likely to have reduced interaction with friends, family, or “me-time.” For those who travel far to work, they may only have time to rest when they get home. During the weekends of employees in a compressed workweek, the balance tips all the way to the favor of the “life.” The employees get three whole days to rest and recover the time that they lost with their family/friends and themselves when they were working. 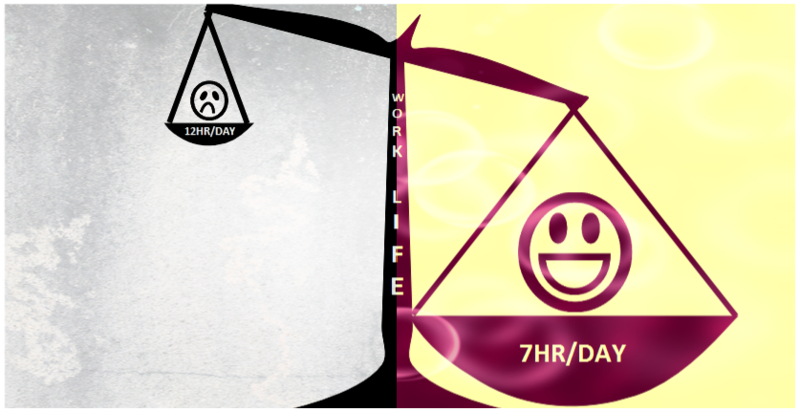 If we compare the time spent working to the time spent “living” (leisure and rest), seven-hour workdays tipped the scale to the favor of “life.” Assuming that everyone needs eight hours of sleep and another eight hours for themselves (using Henry Ford’s notion of how a day should be spent), seven-hour workdays gives five more hours to rest and recover in a week for employees. One of the biggest concern that employers have for less working hours is the possibility of lower productivity. In a study conducted by Harvard Business Review, employees who are given the privilege of working less feel appreciated, and such employees tend to perform better at work. With the privilege of working less hours, Filipino employees with utang na loob (debt of gratitude) will reciprocate the privilege with dedication and effort. Generally, Filipino workers are resilient and dedicated to their work, mainly because of their urgency to sustain their family, lifestyle, dreams, and themselves. However, despite being propelled by the reasons that drive them to work their butts off, stamina and mental focus tend to waiver as work hours become extended. To keep the employees energized and mentally sharp, fatigue needs to be offset, and the way to do it is to allow more or longer breaks. In a study that monitored work habits, researchers concluded that the ideal break to work ratio is that for every 52 minutes spent working there should be a 17 minute rest period that follows it. On the part of the employees, they need to make an adjustment in their lifestyle like meal planning, assuring adequate sleep, and so on. They also need to mentally discipline themselves to take on the sacrifices that one need to work 12-hour shifts for four days. The good thing about being consistent, given enough time, employees can adapt to the schedule and working conditions. They simply adapt to it. Besides from the ones mentioned above, companies and employers should invest in keeping the moral high, encouraging healthy practices, and being reminded of the fruits of working such a schedule is also important. When it comes to working only for seven hours, getting employees to give it their best in a condensed working schedule falls heavily on implementing the right business culture and attitude. As could be seen in Germany, their culture and discipline of coming to the workplace to work and their goal-oriented mindset are what it takes to make them productive, despite working fewer hours. Besides from being resilient, Filipinos are known to adapt well to different situations and culture. Filipino employees adopting the German work ethics is not impossible as long as the employers impose and maintain such business culture and mindset. Furthermore, with less working hours in stake, Filipino employees who recognize it as a privilege are less likely to take their work for granted. They usually reciprocate it with loyalty and productivity. Burnout – For employees, the biggest possible issue for 12-hours a day schedule is burning out, which is a major problem for employers. Burnouts render the employee unproductive, or even worse, be sick. Due to the longer exposure to work stress, the likelihood of crashing and burning is not that far off. Absence Coverage – If for some reason an employee could not make it to work, finding another employee to cover the shift gets a bit complicated. After a 12 hour shift, employees might not be willing to extend, especially if they have to work the next day. Furthermore, doing overtime can lead to a burnout. Ergonomic Issues – The longer the hours are at work increases the ergonomic hazards in the workplace. Higher exposure to repetitive tasks, poor workplace lighting, vibrations, and other similar dangers help develop musculoskeletal injuries to employees. Payroll Adjustments – Switching to a 12-hour work schedule means changes in company payroll policies. Employers need to establish break frequencies, overtime rates, and schedules. If there are multiple schedule types in the company, it may get complicated. Not in the Regulations – Since the Philippine government shows no sign of breaking from the long-established 40 hour work weeks, there is no law that allows it to be reduced to 35 hours. But by chance that the government goes with it, they would have to work out the kinks like deciding on who compensates for the monetary loss for both the company and employee for working less. In Germany, the government subsidizes the work hour, while in France, companies need to shell out extra money to compensate the employees. Furthermore, the Philippine government also need to impose new laws when it comes to overtime pay, days off, and so on. Employee Overhead – The initial intention of developing the 35-hour work schedule was to lower unemployment rate. With a seven-hour work schedule, there are hours that won’t be covered. Roughly around three hours will not be covered, which could result in having to hire a new employee. However, this may only apply to businesses that need 24-hour daily coverage. Expensive Initial Stages – The startup expense to shift to a seven-hour workday tend to be costly. The implementation process of planning to cover unmanned hours may mean additional expenditures at first. The 40-hour work week has been around since Henry Ford implemented the idea back in 1914 to promote work-life balance. Ford believed that by reducing the industry standard (at the time) of 48-hour workweek to 40 hours is the best way to promote wellness among employees. At this day of age, when more Filipino employees are getting smarter and faster, reducing the working hours to seven may reap more benefits than a 12 work schedule for both employer and employee. With careful planning, guts, and discipline, the 35-hour work schedule could provide a positive impact on the company’s productivity and wellness of the employees. When it comes down to it, quality always beats quantity in any given day. Monitoring and calculating the payroll for the new work schedules could get complicated, but we’re here to help. JustPayroll.ph offers enterprise-grade payroll software, premium biometric devices, and superior outsourced payroll services.